Use the Exchange 2013 Jetstress version to stresstest your storage solution. Continue to use the Exchange 2013 version as long as the Exchange 2016 version is not available. The Telnet-Client is optional, but I prefer to install this for troubleshooting purposes later on. Figure 2. The second step, preparing the Active Directory configuration partition. When one step is performed you have to wait until all changes are replicated between all Domain Controllers before you continue with the following step. if you only installed the Desktop Experience feature in the previous step, you should setup let install the prerequisite software as well by adding the /InstallWindowsComponents switch to the previous command. Figure 3. The Server Role selection in the graphical setup, including automatic installation of prerequisite software. In the window as shown in Figure 3, check the checkbox next to Mailbox role, and check the checkbox for Automatically install Windows Server roles and features that are required to install Exchange Server. 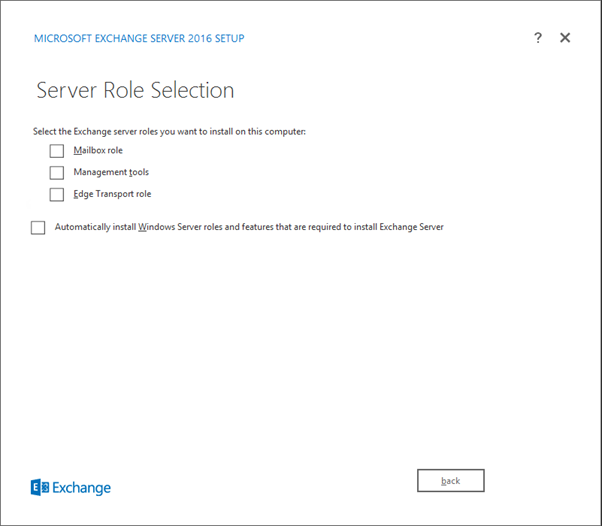 When the Exchange 2016 sever is installed, reboot the server and continue with the Post Installation Configuration. Figure 3. After installing the Exchange 2016 server reboot the box. These steps will be described in the following sections. Since PowerShell (and thus the Exchange Management Console) is the primary means of managing your Exchange environment I’ll discuss all options using PowerShell instead of the GUI. External Relay – This Exchange 2016 environment will accept SMTP messages, but will forward these messages directly to another messaging platform. When you have created an AcceptedDomain you can create an Email Address Policy. All Mailboxes will be configured with the email address you specify in this Email Address Policy. If you specify some sort of filter in your Email Address Policy only those users that are filtered will have the Email addresses applied. New-EmailAddressPolicy -Name ExchangeLabs -IncludedRecipients AllRecipients –ConditionalCompany "ExchangeLabs" -EnabledEmailAddressTemplates "SMTP:%l@Exchangelabs.nl"
New-SendConnector -Internet –Name "To Internet" –AddressSpaces "*" –DNSRoutingEnabled:$TRUE –SourceTransportServers "EXCH01"
Where EXCH01 is the Exchange 2016 server we just installed. New-SendConnector -Internet –Name "To Internet" –AddressSpaces "*" –DNSRoutingEnabled:$FALSE –SourceTransportServers "EXCH01" –SmartHosts "IP Address of smart host"
You need a 3rd party UC certificate for your Exchange 2016 environment, just like Exchange 2010 and Exchange 2013. Check out the Unified Communications certificate partners (KB929395) knowledge base article for a list of supported UC vendors. 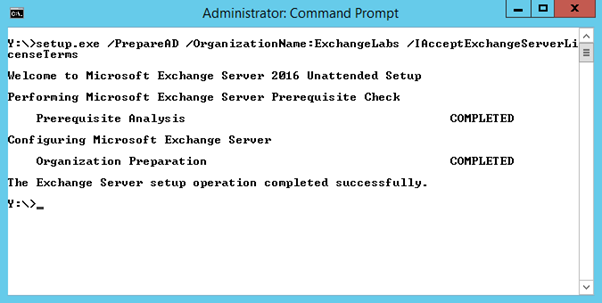 When all settings have been applied to the new Exchange 2016 server, just reboot another time, just in case…. 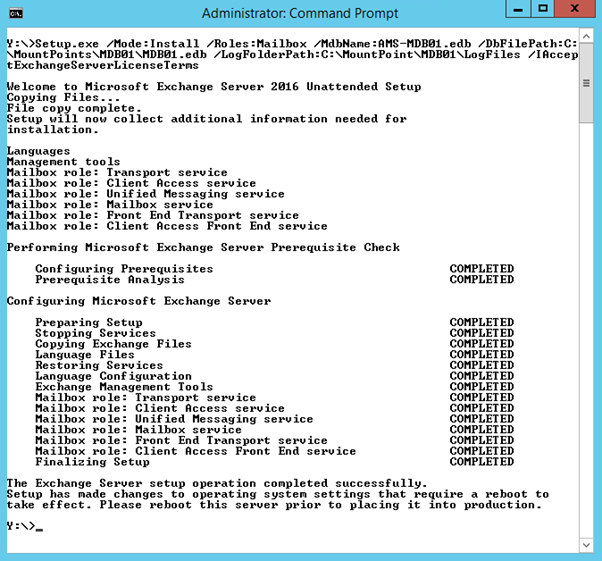 In this blogpost I explained how to deploy an Exchange 2016 server, including the prerequisite software and the post installation configuration. Since the majority of the Exchange server can be (and needs to be) configured with PowerShell I didn’t explain how to use the GUI but use PowerShell instead. When configured properly you can start testing your Exchange 2016 externally (using https://www.testexchangeconnectivity.com) or internally with Outlook clients. Please keep in mind that you need Exchange 2010 with all recent patches, but Outlook 2013/2016 will give better results. Hey. I have followed your tutorials and created exchange MBX but what can I change from your tutorials so I can add a second mailbox into the system? ah thanks man. btw did you also do a guide on high availability exchange?